All persons making entries should acquaint themselves with the general rules and regulations. All residents of the Coosa Valley area are eligible to enter articles in these departments. There is no charge for entering exhibits in these departments. ENTRIES WILL BE ONLY ACCEPTED SUNDAY, SEPTEMBER 30, 1 P.M. TO 4 P.M.
On receipt of entry, an entry tag with claim coupon attached will be filled out, specifying the Department, Division and entry number of the articles as entered in the Department Office of the Fair. These cards will be securely attached to the article to be exhibited. The claim coupon must be retained by the exhibitor until the close of the fair. When presented to the Director of the Department, the coupon will be an order for the article corresponding in number. ITEMS ENTERED AS PICTURES IN ADULT CLASSES MUST BE FRAMED AND WIRED FOR HANGING. BEST IN DIVISION winning exhibits from a prior year are NOT eligible to compete for Best in Division during current year. Previous winning exhibits are eligible to compete for Class awards. 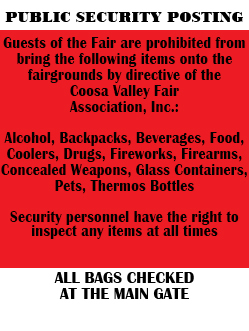 The Coosa Valley Fair Association will not be responsible for loss or damage to any exhibit but will give the best care and attention to prevent loss and damage to any exhibitor. All entries will be judged on Monday, October 1st. Where there is no competition, prizes will be determined by the judges. Ribbons will accompany the prizes. Articles entered in collection classes cannot compete for premiums in individual classes. Articles entered for premiums must be placed in the correct department and division or they will not be considered as competing for premiums. All premiums will be paid at the Premium Office of the Coosa Valley Fair Association on the fairgrounds. Premiums and prizes are paid only from awards made by the judges as they appear on the signed judge’s sheets and cards of record and NOT from ribbons attached to the exhibit nor from unofficial newspaper reports of listings. This rule is strictly enforced because the judges’ reports are the only official records of correct awards. Ribbons may be misplaced or tampered with and newspaper listings may be incorrect. 16. OWNERS MUST PICK UP THEIR EXHIBITS AT THE END OF THE FAIR. EXHIBITS ARE TO BE REMOVED FROM THE FAIR ON SUNDAY, OCT. 7, 1 P.M. TO 4 P.M. — BUT NOT BEFORE THIS TIME. AWARDS SHOULD BE PICKED UP BY 4 P.M. SAME DATE. IF NOT PICKED UP WITHIN 30 DAYS OF THIS DATE FROM THE PREMIUM DEPARTMENT, CASH AWARDS WILL BE DONATED TO THE FAMILY RESOURCE CENTER.